Convertible Bench Tables transform from a single-sided table to a comfortable bench to a full-size cafeteria table. Our most versatile school table! 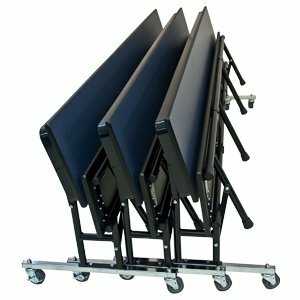 Bench Legs on 6’, 7’ and 8’ models provide additional load-bearing capacity. Our 7’ and 8’ models feature eight points of floor contact, including four legs under the bench. Holds up to the rigors of today’s school environment. Poly II Caster Wheels provide excellent floor protection, abrasion resistance, high impact strength, and easy, quiet operation. They are non-marking and resistant to water, oil and most chemicals. Mobile tables move with little effort on these long-lasting wheels. 25” High Table model offers lower table height. Smaller size perfect for Early Childhood settings. Locking Casters and Optional Top Latch securely hold the 34/35M Convertible Bench Table in place. Table or bench configurations safely stay where you need them. Our latch is discreetly located under the tabletop — an industry exclusive. Out of the sight of students. Wilsonart® Laminates are abrasion resistant and meet or exceed NEMA specifications. Customized Graphics, including school mascot and colors, promote school pride. Quick Ship Tables: This table may be available for shipment within 10 business days after receipt of PO. Read more. Our most popular models matched with our Stocked Laminates. We have the highest GREENGUARD® certification and strive to incorporate environmentally friendly practices in our manufacturing and product delivery processes.We have been awarded both the GREENGUARD Indoor Air Quality Certification® and the more stringent Children & Schools Certification (daycare and K-12) by the GREENGUARD Environmental Institute (GEI). All GREENGUARD® products have been tested for their chemical emissions performance and can be found in the GREENGUARD® product guide at greenguard.org. 15-year Warranty: As part of Palmer Hamilton’s on-going commitment to quality, we warrant that our mobile tables will be free from defects in original material and workmanship for a period of fifteen years from the original shipment date. Our guarantee!